If Chanel No. 5 is Marilyn Monroe and Lanvin Arpège is Norma Shearer, then Balenciaga Le Dix is Gene Tierney: fresh, crisp, beautiful, and down-to-earth. Le Dix is the aldehydic floral that goes out to lunch on a weekday for lots of clever conversation but not an inappropriate amount of intrigue or cleavage. Osmoz lists Le Dix’s top notes as bergamot, lemon, peach, and coriander; its heart as rose, lily of the valley, lilac, and orris; and its base as vetiver, sandalwood, tonka, and peru balsam. I don’t see violet listed in the notes, but if I had to list first two notes I identify in Le Dix I’d say “aldehydes” and “violets”. Le Dix’s drydown is gorgeously creamy and woody and reminds me of Chanel Bois des Iles. The overall feel of the fragrance is a lot like the new Piguet Baghari. I’ve had a bottle of Le Dix Eau de Toilette for a few years. I wear it mostly in the spring and summer and mostly with a blouse or dress that I’ve had to iron. There’s something in Le Dix and in the crispness of ironed cotton that goes together. At about the time that my dress is creased and lipstick smudged, Le Dix relaxes, too, into its wonderful sandalwood and tonka base. The Eau de Toilette has moderate lasting power and won’t irritate the person in the next cubicle. Balenciaga Le Dix is hard to find in stores but easy to find and inexpensive online. A quick search found several sites offering a 100 ml bottle of Eau de Toilette for less than $30. Angela, you are quite the writer. I love your descriptions. I get it when you talk about crisp, ironed shirts with this scent! I'm going to seek this out because you mentioned the magic word: violet. Thanks for a great review! N, thank you! I'll make a sample for you so you can try it. ps, on aromascop.com, donna wrote a lovely article on the perfume house– worth checking out!! Similarity in feel to Bois des Iles? Le Dix has officially marched to the head of the lemming parade! Now, to go find some! It's definitely worth a try! I'd love to know what you think of it. What is aldehyde to perfumes? I read and read and still don't understand the true meaning of this type of perfume? Thelma, I bet if I laid out five aldehydic perfumes for you to smell, you'd sniff them and say, “Aha! Now I know what you mean!” Perfumes with a lot of a particular type of aldehyde–a chemical compound–have a sharpness about them. Some people call the smell “perfume-y”, and other people say that it's a “scintillating” smell, like champagne. Usually the aldehydes are in the top note and fade away after a while. The scents I'm reviewing this week all have that sharp, almost sneezy aldehydic top note. You know Angela, one of these days I'm going to count up all the perfumes on my wish list (and on my shelves–Jolie Madame, Dzing!, Vol de Nuit parfum…) for which you're responsible. Interesting observation! I hadn't thought of it, but now that you mention it it does seem true. It's a big circle! We're all adding lemmings to each other's lists. Those are some mighty fine perfumes, though. Interesting review! Normally aldehydes and I don't really get along – I never seem to get the fizzy champagne aspect – just the musty sneezy one. However the notes in this sound so appealing! If I ever run across it I will certainly give it a try. Aldehydes can be tough, and Le Dix is definitely aldehydic. But I really like how it shifts from the crisp opening notes to the warmer dry down. I'd love to know what you think of it if you do get the chance to try it. I have been a fan of Le Dix since the mid-1970s, when a former amour brought it back from Europe. I especially love the parfum, but alas, I cannot find it (except occasionally on eBay). Can anyone confirm that Le Dix has indeed been discontinued? I'd be shocked if it were discontinued, especially with the resurgeance of the Balenciaga name. I sure hope it isn't! Le Dix is one of the few cases where, at least it seems to me, the EdT is just as nearly as the parfum. Of course, there's always something wonderful about dabbing parfum. Angela – Thanks for your comment. I wish your hope was true, but, alas, as far as I can tell, Le Dix is no longer being produced in any form (esp. 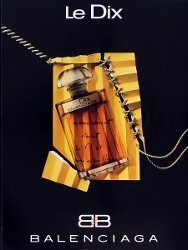 parfum). I'm waiting (and hoping) for someone else here to tell me I'm wrong…..
As far as the EDT and parfum — I definitely notice a difference! For me, the EDT is slightly more bitter (if that's the way to describe it). The parfum, on the other hand, was richer, fuller, deeper, and is some way – a little bit more creamy. I recently found a small quantity of the parfum on eBay and won the auction. I am eagerly awaiting its delivery. The seller informed me that she was auctioning off an estate and had discovered several small bottles of the parfum, still in boxes. I purchased all of them! I hope they haven't aged. Anyway — if anyone hears of Le Dix parfum being sold anywhere, please let me know. Well, that's just terrible news about Le Dix. I hope you're able to find enough of it to last you! By chance, I wore the parfum version of Le Dix to bed last night. It really is wonderful. I recently found a mini (3ml) of the parfum on eBay and snapped it up. It was only a little more expensive than a sample would have been, so I felt justified, even though I hadn't sniffed it. Am trying it today and will update with what I thought. I'm betting that my husband won't like it, though. He likes fresh, girly florals… sigh. You never know, though. Maybe on a winter's night a little more sophistication in a perfume will be in order. It’s nice to have someone confirm my thoughts, too, so thank you! I’m so sad Le Dix is discontinued now.